17 Responses to Power to (Altruists Concerned With) the Poor? Larry, I don’t disagree with your general assertion that the poor are relatively less politically powerful than than the rich and corporate interests, however, I’m not sure I agree that your data here is good evidence against Klein’s point (not that Klein’s evidence was great either). It seems like the relevant data would be something that shows the counter-factual of how the poor would fair if they did not have any of the programs that Klein cites – after all, it might be that the programs have actually caused the poor to be far better off than they would be without them and thus, arguably, represent political power. Admittedly, this would be difficult to demonstrate, but I think it is one of the relevant counter-factual. For good evidence regarding the relative power of the poor and the rich, type “Gilens” in the search box above. But that is not Klein’s point, or mine. His point is that political allies of the poor (aka Democrats) sometimes win, or have done lately. My point is not that his point is wrong, but that it is “more than a little bit obtuse” in light of the broader economic and political situation. This is a difference not of counter-factuals, but of perspectives. It might be quibbling, but there are plenty of people out there these days who, if they had more clout, would see to it that spending on food stamps did not increase merely because of escalating need. Is the PDS graph exaggerated by the results of the financial crisis that pummeled the 401K’s of the working class? The decline of the lower tiers sure accelerates in 2007/8 . I’m not sure what you mean by “exaggerated”–the financial crisis is what happened to people. The paper I linked to includes another figure (2b) showing the same trends excluding real estate. In that one, people at the 95th percentile are 11% ahead of where they were in 2003 (though behind where they were in 2007); people at the 25th percentile have lost 99% of their non-real-estate wealth since 2003, and the decline is roughly linear (i.e., beginning well before the Wall Street crash). I can see why Prof. Bartels would start with 2003, but one might argue that the housing bubble was starting. Would using 2001 or 2000 or the late 1990s change the overall picture much? *why Pfeffer, Danzinger, and Schoeni would begin with 2003. Figures 1 and 2 strongly suggest that the context has been dire for the lower income tier of the working class and the housing bubble per se is not the entire story, but it would be of interest to see a plot of net worth excluding real estate from an earlier date as well given the build up of household debt over that period. There is no clear class pattern in the role of real estate in the wealth crash. For people at the 25th and 50th percentiles of the wealth distribution, more than 70% of wealth losses between 2003 and 2011 were in real estate; for people at the 5th and 75th percentiles, less than half; for people at the 95th percentile, big losses in real estate balanced by big gains in other assets. 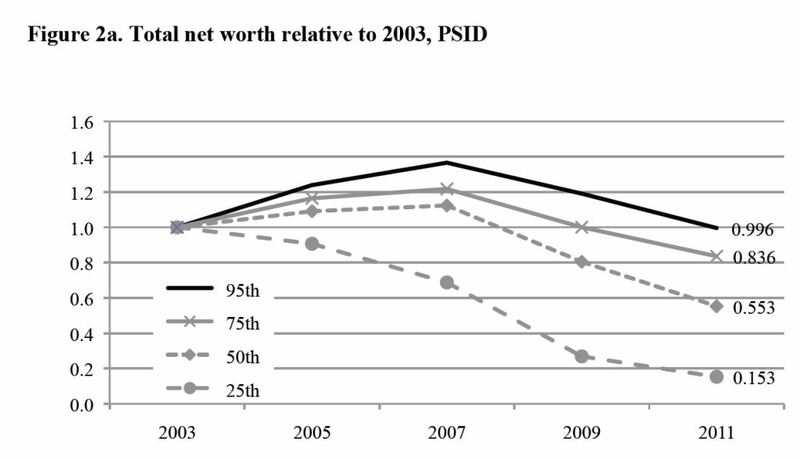 More generally, there was no real increase in the net wealth of people at the 25th percentile at any point between 1984 and 2003; so if they were enjoying “fictitious” (more accurately, temporary) gains in real estate wealth, they were losing significant ground with respect to other assets even while the bubble was inflating. Even more generally, if you don’t want to think about bubbles, crashes, or trends of any sort, please just focus on the fact that a statistically typical household in the bottom half of the wealth distribution in 2011 had $1500 in net worth , of which $1475 was illiquid (home equity). If this sounds like a “comforting” political system in action, then by all means carry on. The first statement is not hard to explain. People at the 50th percentile or below have very little liquid wealth and disproportionate amounts of fictituous real estate gains (compared to their incomes). For people at the 5th percentile, the impact of the housing crash is blunted by the fact that many of them don’t own real estate at all (they are primarily renters). Yes, it is sad that people at the 25th percentile were not making any ground. It is sad that households at the 5th percentile have negative net worth (by the way, how much of it is student debt?) I just think it’s necessary to have the causation clear. The story is focused on the losses suffered by the lower classes in 2003-11, but these losses really originate further back and housing bubble only obscures some of the dynamics. The high point of housing ownership was somewhere around 68% of families and that inflates the number a bit. If over 30% of families have never owned their homes, then it is hard to believe that “it was quite common for the low income to gain $100k to $200k in value.”. Certainly this happened but it wasn’t among the bottom 40%, instead it was the 30-40% above, between the 40th and 80th percentile where this happened. I would quibble with Dr. Bartels on the food stamp program. The fact that it is not a program with a set budget that it uses and then shuts down (which is what Pell Grants do) but instead covers everyone who meets the eligibility requirements is hugely important and a sign that sometimes the poor are helped. Of course the Food Stamp program is being hammered and may not survive in its present form…….. Google Bob Dole/George McGovern to read Dole’s statement about working with McGovern on these issues (one of the classiest eulogies you will read and proof that sometimes people can work across ideological divide). If increased food-stamp expenditures is evidence of recession rather than political power, isn’t that just as true of declining net worth? Yes, the recession hit everyone and wealth declined across all income strata. But, mere fact that wealth declined across the board due to the recession is irrelevant since the rate of decline in each percentile was NOT constant. The 95% suffered little in the recession (0.004% decline in wealth) as compared to the 50% percentile (0.447% decline), and in turn, the 50% percentile suffered far less than the 25th percentile (0.847% decline). Why? That’s for further study and speculation. My speculation is that the top 25% could liquidate declining assets faster and more efficiently early in the financial crisis than the remaining portion of the population. The remaining wealth holders was more closely tied to assets they could not directly control (e.g., 401(k) assets), easily liquidate (e.g, real estate) and/or could not de-leverage fast enough (e.g., selling highly leveraged real estate that was declining below the mortgage balance). The bottom 25% had little or no hard assets, but their income took a severe nose dive with massive layoffs, meager unemployment benefits, and pensions either worth pennies on the dollar or wiped out. Of course, my speculation is not definitive, all-encompassing or even correct by any stretch of the imagination. Pease define power, counterfactual, and make a clear argument. Are you saying that if poor had more power, whatever that is, they would not have lost as much wealth, or they would have received compensatory transfers? Or what exactly? Maybe they have too much power. Enough power to get cheap credit suported by Fannie and Freddie, and, ultimately, tax payers (not the poor). So on minimum wage they get a 300K morgage, buy at top of bubble, and after 2 years, when house is worth 200K have negative wealth. I am not saying this is what happened, I haven’t a clue. But without better definitions and theory, anything goes. Cheap credit supported by Fannie and Freddie? Mortgages originate at banks, which then bundle them into large denomination packages purchased by Fannie and Freddie, who in turn issue bonds backed by the income stream generated by borrowers paying the underlying mortgage loans. No one held a gun to any banker’s head and said, “Bill, you gotta make this loan because I’m from the government and I demand you give this non-creditworthy applicant a mortgage loan.” And, the crisis first made its appearance not with Fannie and Freddie, but in the private sector competition – Bears Stern ring a bell? Let’s allocate blame where it belongs. Did Greenspan’s Fed keep rates too low for too long? Yes. Did it over-prime the money flows? Yes. Did the Fed fail to have even a reasonable skepticism about “self-policing” and “self-regulation” by financial institutions? Yes. But, it was the banks that had the ultimate control over where, when and who got loans, not the federal government. The banks all on their own made bad decisions, over and over again, chasing profits to fuel Wall Street ever increasing demands, and the hubris of financial institution management. Mortgages originated at the banks, then handed off to Fannie and Freddie, not vice versa. The former got their fees and got out, passing the buck to the government agencies and their bond holders.